Jim Thorpe was arguably the greatest all-round athlete of the 20th century. He was probably also the unluckiest. At an admirably organised Olympics Games that introduced electronic timing and a public address system, the awesomely talented Native American won the pentathlon and the decathlon. An American of Indian and Irish ancestry, he also was fourth in the high jump and seventh in the long jump. 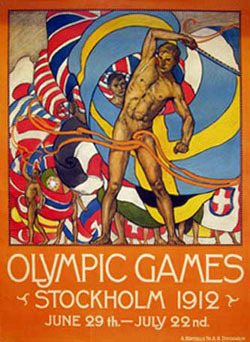 He gained the admiration of King Gustav of Sweden who presented Thorpe with a bust of himself and a silver chalice in the shape of a Viking ship, commenting: "Sir, you are the greatest athlete in the world." According to contemporary reports, Thorpe replied: "Thanks, King." Six months after his triumph, however, a newspaper reported he had breached his amateur status by playing semi-professional baseball in North Carolina in 1909 and 1910. The punishment was savage. Thorpe's records were eliminated from the books, his gold medals taken away and he died a miserable death as an alcoholic in a Californian trailer park. In 1982, some 29 years after his death, the International Olympic Committee officially pardoned Thorpe and presented the medals back to his family, a fitting tribute to the man voted the greatest athlete of first half of the century. Finland 's Hannes Kolehmainen was the other success story of the Games, taking three gold medals in the 5000 metres, 10,000 and 12,000m cross country, beginning a Finnish dominance of the long distance events over the next 30 years. But there was tragedy in the marathon where Portugal 's Francisco Lazzaro collapsed and died during the race. Endurance seemed to be something of a theme during these Games as the only cycling event was a distance of 199 miles and the contest for the silver medal in the Greco-Roman middleweight category between Russia 's Martin Klein and Finland 's Alfred Asikainen lasted an incredible 11 hours 40min. In the light-heavy weight finals the judges had to halt the fight after the bout had gone for over 9 hours. Both the wrestlers were given silver medals, with no gold awarded. The modern pentathlon was introduced for the first time in the Games, consisting of horse riding, fencing, swimming, shooting and cross-country. In the fifth place of this event was one Lieutenant George S Patton, who later became a controversial American general during the World War Two. Women also made their debut in the swimming events, with the British 4x100m relay team winning gold. Another notable debut was that Japan became the first Asian country to compete in the Olympics.